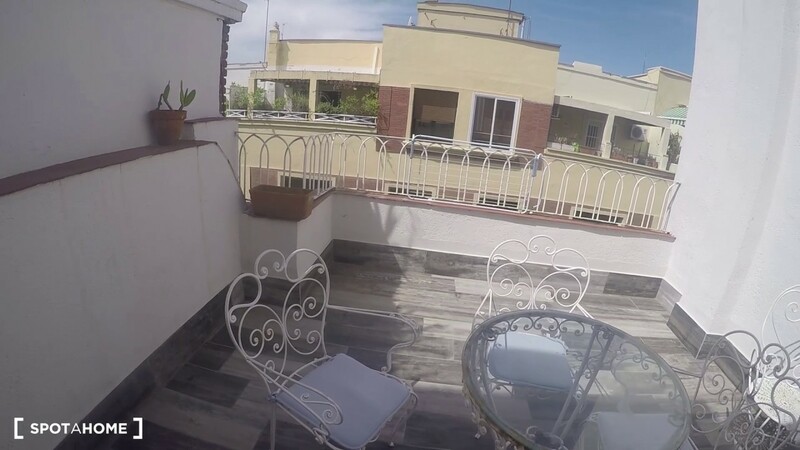 This 6-bedroom apartment on Calle Juan Alvarez Mendizabal, Argüelles, is a spacious 199 m² and has 3 shared bathrooms. Other common amenities included a washing machine, equipped kitchen, living area, and 2 gorgeous private terraces. The apartment boasts a fantastic location close to Parque del Oeste, Plaza de España, and Madrid Rio. This area will make a fantastic base to explore the city, with public transport, shops and restaurants right on your doorstep. The apartment has been recently renovated and is beautifully decorated. The living area has 2 sofas and a television, ideal to watch a movie with your flatmates. The terraces have a range of outdoor furniture so you can enjoy Madrid's sunny weather. There is central heating for the colder month. Miguel the homechecker told us that he really loved this property. This large 6-bedroom apartment is best suited for sociable people. Ventura Rodriguez metro station is a 5-minute walk from the apartment and serves line 3.